In 1930, Tommy Angelo is a cab driver working in the American city of Lost Heaven when he is 'asked' to help two gangsters, Sam and Paulie, escape from a rival Mafia hit squad. With the rivals now gunning for Tommy as well, he reluctantly accepts the offer of employment with Sam and Paulie's boss, Don Salieri, and begins a life of crime. Mafia spans a period of eight years and chronicles how Tommy's life takes a dramatic upswing as he becomes a respected - and feared - member of the local community. Tommy enjoys the camaraderie of fighting alongside his fellow mobsters, which he likens to being a soldier in a war, but is also concerned when innocents are harmed in the course of their business. As the years pass, the city grows and changes, more advanced cars come out on the market and Tommy realises his soul is being eroded as the once-romantic vision he had of life as a Mafioso is replaced by the hard, cold reality of a life of brutality, blood and treachery. Mafia was released in 2002 and dismissed by many as a Grand Theft Auto 3 clone, especially as the X-Box and PS2 ports subsequently released were pretty terrible. However, the PC version of the game remains one of the more underrated titles of the last decade. At first glance, Mafia does resemble the GTA titles: you control a character who goes around a well-realised city, gets into gunfights and is able to use transport such as cars, buses and trams to get around. However, Mafia is very different in both tone and structure. Mafia is much more serious. There are real consequences to running around and mowing civilians down with tommy guns, and the fact that you take injuries if the car crashes or flips over means that high-speed insane stunts are discouraged. The police are also much more on the ball, and will fine you for speeding or running red lights. Whilst you can 'jack' cars on the road, doing so is risky (the offended driver roaring off and dragging you under the wheels is a real danger) and it's not really a core part of the game. The overall idea is that as a member of the Mafia and on the surface a respectable guy you're supposed to be keeping a (relatively) low profile. Structurally, the game is also different. In the GTA titles it's up to you when you do a mission and you can just drive around and cause random mayhem if you choose. Mafia is primarily mission-based and you move from one story-driven mission to the next with no break to go off and explore the city. As the game progresses, however, you unlock various stages of the 'free ride' mode which loads up as a separate game and allows you to go exploring by yourself if you wish. Completing the entire game opens up the 'free ride extreme' which is similar to the freeform GTA style of gaming, complete with doing various jobs for money. These elements feel like possible sops by the developer to the publisher, who was perhaps keen to cash in on the "GTA-in-1930!" angle. The heart of the game lies in the story and the story is stellar. Anyone who's seen a Mafia movie or read a Mafia novel will likely predict most of the story turns before they happen, but the plot unfolds with verve, confidence and expert pacing, delivered by exceptional voice acting (fans of The Sopranos and The Wire will spot some familiar voices) and some strong writing. Mafia is, at heart, a study of violence and what turns good men into criminals. It avoids cliches - Tommy is inducted by steps into a life of violence but is never 'seduced' by it or has a "What have I become?" moment of corny realisation - and remains, even on a fourth or fifth replay, a compelling experience. As with many games with very strong writing and acting, it does impact on the freedom of the player's choices. In particular, it can be a bit odd if Tommy's just been in a two-minute cut scene regretting the innocent people who were harmed in his last job and then he goes out and runs over two old ladies and crashes into a wall. This is a familiar problem with games and given that the alternative - turning the player into a psychopathic nutjob like Tommy Vercetti in Vice City - doesn't entirely work either, not one that's easy to solve. Probably the best thing is to ignore the oddities and get on with the game. The graphics are still good today, although the somewhat stiff animation is a bit disconcerting ('proper' in-game 3D character animation didn't really take off until Half-Life 2, two and a half years later). At the time of release, however, the graphics were astonishing, literally light-years ahead of the contemporary GTA3 series of games. Whilst they're not as jaw-dropping today, they can now be run on modern PCs with everything switched up to maximum with no problem aside that the viewing distance isn't all that it could be, and buildings pop into existence a bit closer than they should. Sound is also strong, although the music and soundtrack are nowhere near as varied as those of the contemporary GTA games. The handling of vehicles is also excellent, with the cars feeling very solid and heavy, and when they get going they're not going to stop easily. The way new, faster cars are introduced periodically throughout the game and the city changes over time (buildings under construction in one mission are completed in another set three years later) is also well-handled. On the minus side, there are a number of niggles which deny the game flawless status. The quantity of cut scenes in the game is very high, exceeding 400 pages of dialogue, and although it's excellently acted and well-written, having to skip through it once you've seen it once can be annoying. Also, the save system saves the game before the cut scenes, not after them, meaning that replaying missions can involve a lot of irritated hitting of the space bar at the start. And whilst the cops being more on the ball than their Liberty City/Vice City/San Andreas State counterparts is initially very impressive, there are times when you wish you could take off the speed-limiter and go roaring through the city at 120mph without worrying about hearing police sirens in the distance. Finally, the fourth mission involves you have to take part in a motor race which is insanely difficult. Seriously, I know people who've given up on the game in disgust at how tough this mission is. Luckily, the later patches introduce a difficulty meter for the level which makes it much simpler, so this is no longer such an issue. 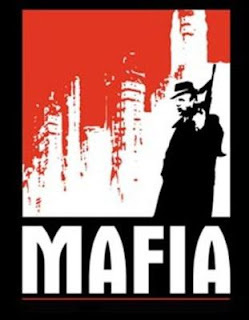 Mafia (*****) is a very strong, compelling and even literate computer game which is more than just a meaningless exercise in violence and mayhem. It has some interesting and intelligent themes going on, but is also a highly playable action title. It is available now on the PC (UK, USA). The far inferior PS2 (UK, USA) and X-Box (UK, USA) ports are also available. A sequel, Mafia II, which picks up on the world in a new city with different characters ten years later, will be released on the PC, X-Box 360 and PS3 at the end of the year.